While we may all know not to judge a book by its cover, there are a few circumstances where appearance is too important to disregard. With over 148 million hotel bookings being made online each year, your property can scrutinised and evaluated by potential customers through photographs and reviews, before they even decide to purchase a room. Customer comfort is imperative to improving your customer experience and the success of your property. If your interior décor is outdated and uncomfortable for your guests, investing in key elements such as modern furniture or commercial drapery are simple ways to add comfort and style back to your property. Read on to find 6 ways to promote customer comfort through interior décor. The importance of the “first impression” in hotel interior design cannot be overstated. Hotels are designed as the luxury ‘home away from home’. If guests are uncomfortable with the overall design, they are likely to leave and look for another place to stay. Hotel interior design acts as a benchmark for the levels of service, quality and comfort that a guest expects. It therefore needs to be consistent and to a high standard throughout the entire establishment. Furthermore, it needs to strike the right balance between operational and visually appealing. By understanding and meeting the requirements of these two approaches, the hotel’s interior design will be based upon functional footing, that creates the required ambience for the comfort of your guests. Lighting can be a great tool to make spaces seem larger than they are and helps improve the mood of your guests. Some simple ways to incorporate comfortable lighting into your rooms, include sheer curtains beneath your drapes and strategically placed mirrors to reflect light around the room. Light coloured walls with warm lights are essential to creating an inviting space for your guests. Investing in dimmers for bedrooms is another good option to enable your guests to adjust their lighting preferences for added comfort. According to a recent survey, 40% of hotel stays each year are for business travelers. When a guest returns to their room after a busy day of meetings, a simple place to sleep and prepare is all that’s needed. This principle is the same for most hotel guests, regardless of their need to travel. After all, people don’t travel just to remain in a hotel room. Having a simple, stylish and de-cluttered room, is essential to allowing your guests the space to breathe and personalize their temporary living space. Think of a hotel room as the bare bones of a personal living space. Each hotel room should therefore only have the essentials and a few alluring accents to make the room more special. The first impression of a hotel is the lobby. While many hotels choose to stun their guests with eye-catching decor, the most challenging and important design task, is to create the lobby as a multi-use space that is available for use at any time. To support travelers of all types, a hotel lobby should feature a combination of social and more private areas for seating and work. The modern tourist expects more than he gets at home, and the bathroom is the room to showcase the balance of luxury and comfort. A resort bathroom with spa-like features, is an open invite to relaxation. It is also the room to add luxurious extras, such as scented bubble-bath, over-sized bathtubs and beauty items for your guests. It is important to design rooms with the modern traveler in mind. Guests want to be able to utilize technology in the same ways that they would at home. Interior design that seamlessly incorporates technology is therefore integral to the comfort of the modern customer. 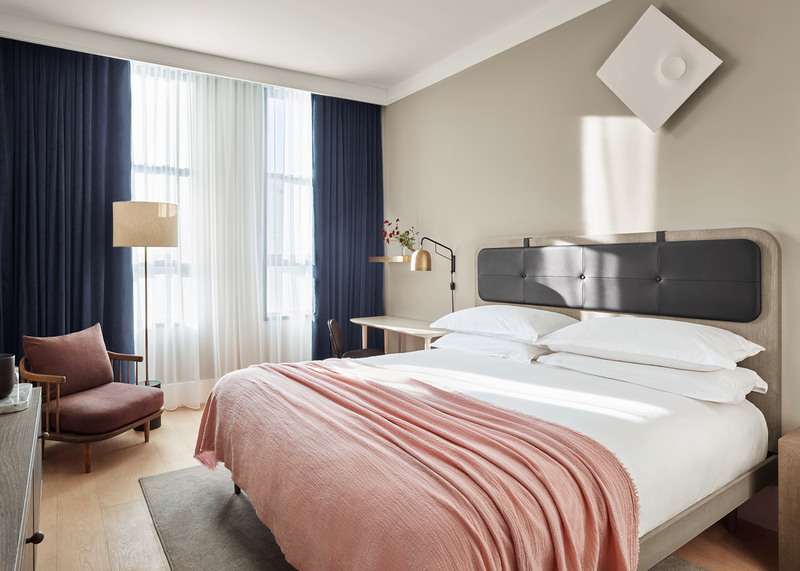 Digital controls over lighting and temperature, as well as ways to charge and connect devices, are just some popular ways that successful hotels are incorporating technology into modern interior design. It is important to not take interior design for granted in the hotel industry. Investing in essential pieces to elevate your interior design, will bring in revenue if it remains consistent throughout your hotel and is well-kept over the years.